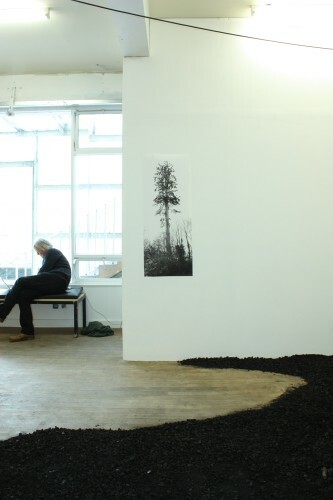 powerS + √ roots – an exhibition by Méadhbh O’Connor and Dave Madigan from Méadhbh O’Connor on Vimeo. 'Burnt Earth'. Scorched tree root system, coal. Within 4 x 4m. 'Burnt Earth'. Scorched tree root system, coal. Within 4 x 4m. Detail. 'Evergreen (Radio Mast)'. Photograph presented as mass-produced poster. 100 x 30 cm. Installation shot. 'Evergreen (Radio Mast)'. Photograph presented as mass-produced poster. 100 x 30 cm. 'Evergreen (Radio Mast)'. Photograph presented as mass-produced poster. 100 x 30 cm. Preparatory shot. 'Competitive Interactions'. 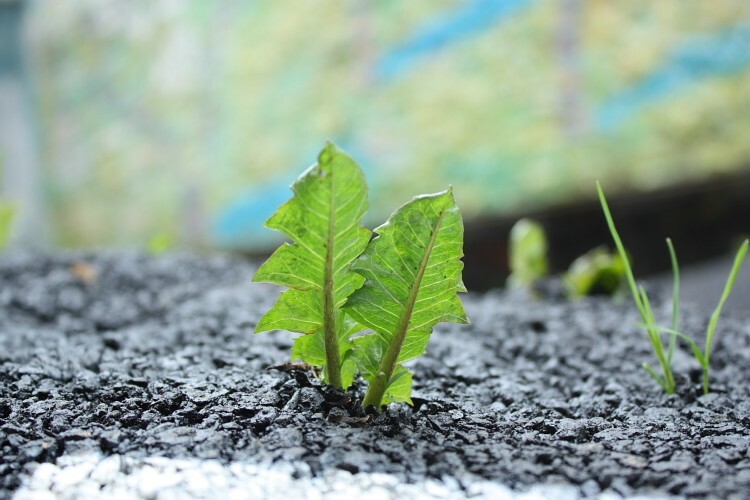 Speed bumps made in the gallery yard with living, propagated weeds growing through the compacted asphalt. Detail of first sign of growth. 'Competitive Interactions'. 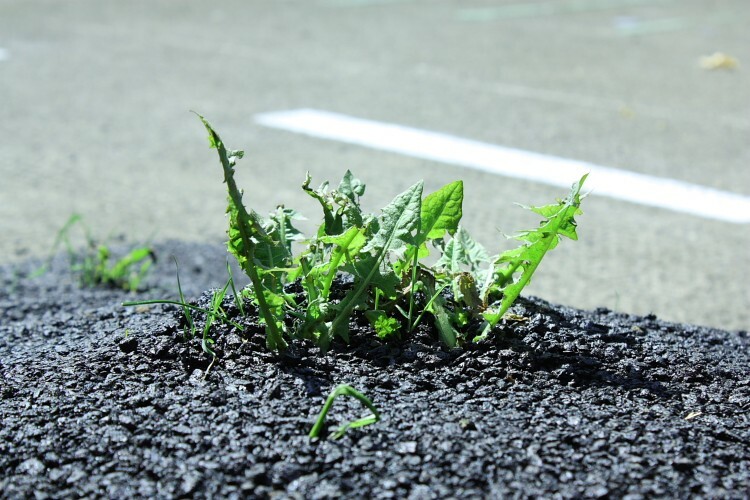 Living, propagated weeds growing through tarmac. Dave Madigan's contribution to the two-person show 'powers + roots', 2013.
powerS + √ roots was the second exhibition informed by the two-year collaboration between Méadhbh O’Connor and Dave Madigan. 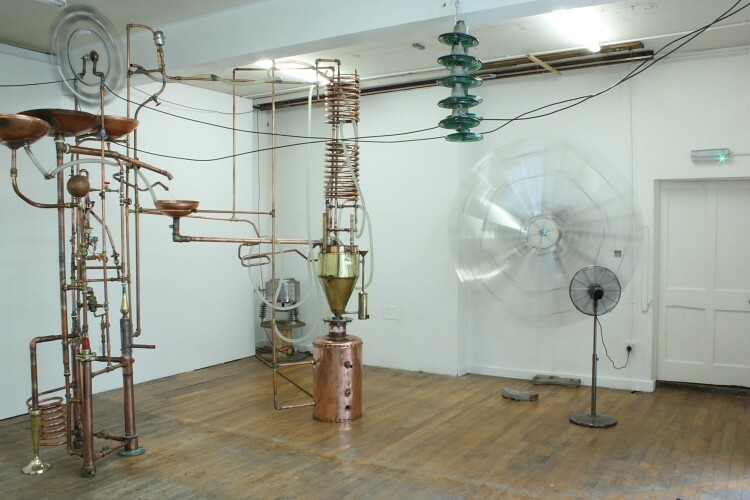 The two artists explored their interests in networks and energy systems, both natural and man-made. Competitive Interactions, 2013. 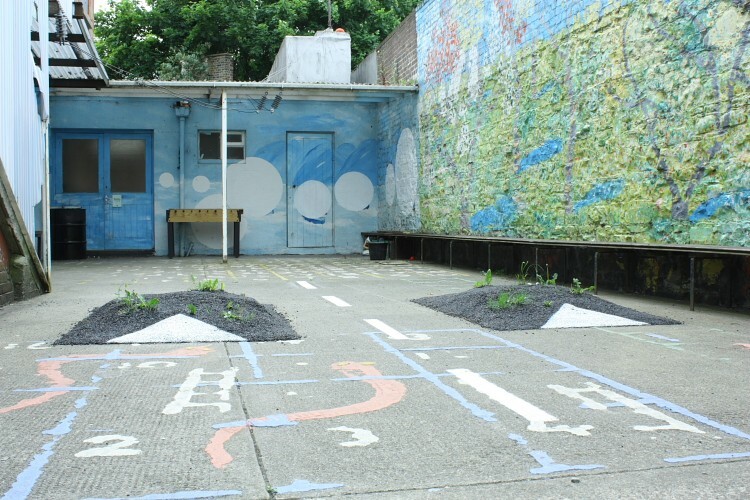 Stone, soil and propagated weeds used to form speed bumps in the gallery yard, and asphalted over. 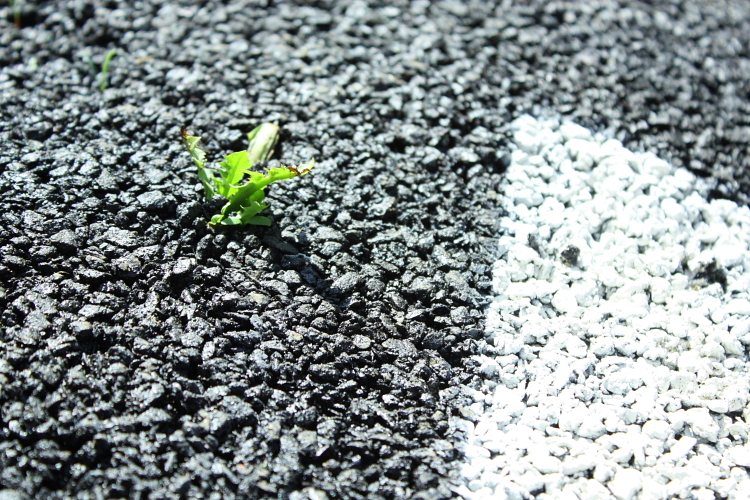 The weeds rapidly grow through the compacted asphalt. Within 5 x 2 x 0.5 metres (L x W x H). 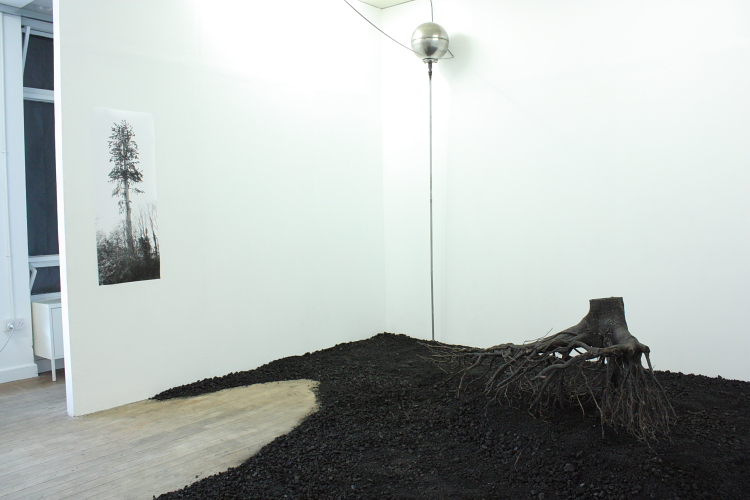 Burnt Earth, 2013. 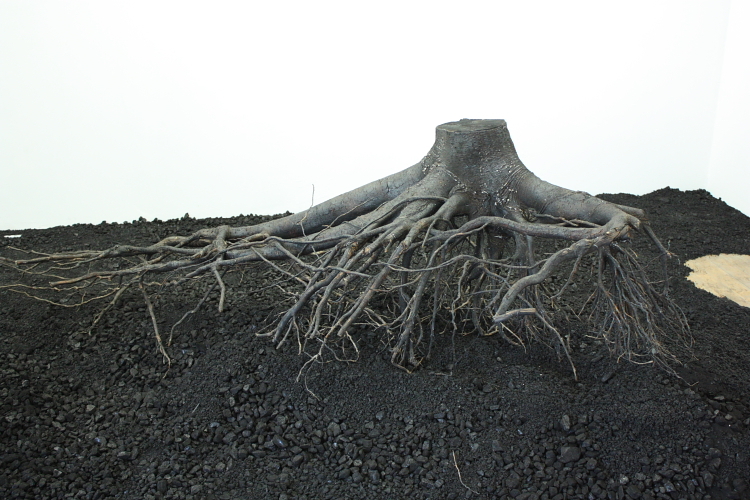 Scorched tree root system laid on a bed of coal. Within 4 x 4m. Evergreen (Radio Mast), 2013. 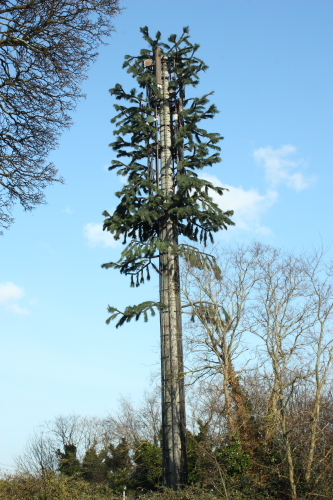 Photograph of a radio mast fabricated to resemble a tree. Presented as a mass-produced poster print. 100 x 30 cm. ‘I sell here, sir, what all the world desires to have: POWER!’, 2013. Copper, brass, aluminium, wood, glass and rubber insulators, electrical cord, etc. (A handmade, ‘marvellous machine’ that was a crossover between a still, steam boiler, water wheel and wind turbine.) Installation occupied approx. 5 x 6 x 4.5 metres (W x L x H).